LLP «Educational Research Scientific and Production Center "Bayserke-Agro"
LLP "Zh. Zhiembayev Kazakh R&D Insititute of Plant Protection and Quarantine"
The results of visual field surveys of the composition of indicator insect species and their abundance, expressed in points, for natural and anthropogenic transformed territories of southern Kazakhstan are presented. The information content of various indices of the species diversity of insects was found at a five-point estimate of abundance. For the studied territories, the most informative indicators on the range of variability were the number of registered species, as well as the polydominance index and the index of Margalef. Under standard visual accounting conditions used, a linear dependence of the type y = 2.8x was established between the number of all marked indicator species, as well as the number of species from individual orders (x) and their numbers in points (y). The data obtained suggest that the diversity of indicator insect species may be the simple and informative regional indicator of the ecological status of individual territories. Barsov, V.A., & Karnaukhova, N.V. (1993). Evaluation of the characteristics of the terrestrial entomofauna to indicate pollution of steppe ecosystems. Bulletin of the Dnipropetrovsk University: Series Biology and Ecology. 1, 50. (In Russian). Gorbach, V.V., & Saarinen, K. (2012). Estimation of occurrence and relative abundance of species in faunistic studies using the example of Finnish daytime butterflies (Lepidoptera: Hesperioidea, Papilionoidea). Principles of Ecology. 2, 45-53. DOI: 10.15393 / j1.art.2012.1087 (In Russian). Gu, W., Ma, L., Ding, X.H., Zhang, J., & Han, Z.W. (2011). Insect diversity of different habitat types in Zhalong Wetland, northeast China. Ying Yong Sheng Tai Xue Bao. 22 (9), 2405-2412. Jana, G., Misra, K.K., & Bhattacharya, T. (2006). Diversity of some insect fauna in industrial and non-industrial areas of West Bengal, India. Journal of Insect Conservation. 10, 249. https://doi.org/10.1007/s10841-005-5094-5. Kascheev, V.A., & Kazenas, V.L. (2011). The basic principles of zoological monitoring of ecosystems of specially protected natural territories of Kazakhstan (on the example of invertebrates). Selevinia, 189-197. (In Russian). Kozlov, M.V. (1990). The influence of anthropogenic factors on the population of terrestrial insects. Results of science and technology. Series Entomology, 13-192. (In Russian). Kuznetsova, I.A., Golovatin, M.G., Gilev, A.V. Gorodilova Yu.V., Pustovalova, L.A., Erokhina, O.V., Stavishenko, I.V., Stepanov, L.N., Gileva, O.V., Zakharova, E.Yu., Oslina, T.S., Lyakhov, A.G., Vurdova, I.F., Sysoev, V.A., Sineva, N.V., Chibiryak, M.V. (2015). Specially Protected Natural Territories of the Sverdlovsk Region: Monitoring of the State of the Natural Environment. Ed. I.A. Kuznetsova. Ekaterinburg: Ural University Publishing House, 189. (In Russian). Lebedeva, N.V., Krivolutsky, D.A., Puzachenko, Yu.G., Diyakonov, K.N., Aleshchenko, G.M., Smurov, A.V., Maksimov, V.N., Tikunov, V.S., Ogureeva, G.N., & Kotova, Т.V. (2002). Geography and monitoring of biodiversity. M.: Izd. Scientific and educational center, 432. (In Russian). Litvinova, N.F., Guseva, V.S., & Vorontsova, L.I. (1991). 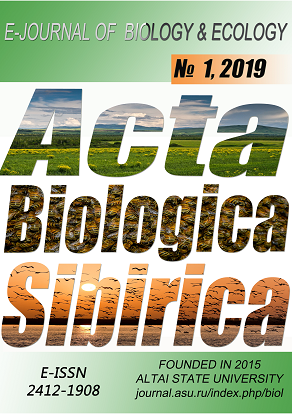 Some regularities of anthropogenic succession of vegetation and locust population in the conditions of the dry steppes of the Lower Volga region. Animal world of the European part of Russia, its study, use and protection. M., 33-40. (In Russian). Marttila, O., Saarinen, K., & Jantunen, J. (1999). The national butterfly recording scheme in Finland: first seven-year period 1991-1997. Nota lepidopterologica. 22. 1, 17-34. Mauricio da Rocha, J.R., Almeida, J.R., Lins, G.A., & Durval, A. (2010). Insects as indicators of environmental changing and pollution: a review of appropriate species and their monitoring. Holos Environment. 10, 2. 250. McGeoch, M.A. (2007). Insects and bioindication: theory and progress. In book: Insect conservation biology. Editors Stewart, A.J.A., New, T.R., Lewis, O.T. Chapter 7, 144. Paly, V.F. (1965). On the determination of the abundance of faunistic studies. Collection of entomological works. Frunze, 112-121 (In Russian). Pesenko, Yu.A. (1982). Principles and methods of quantitative analysis in faunistic studies. M.: Science, 287. (In Russian). Slivinsky, G., Temreshev, I., Issenova, G., Kozhabaeva, G., & Sagitov, A. (2018). Insects as bioindicators of industrial pollution in Kazakhstan. Bioscience Research. 15 (2), 1270-1282. Slivinsky, G.G., Kazenas, V.L., & Temreshev, I.I. (2017). Species diversity of the entomofauna in the territories of the south of Kazakhstan with different anthropogenic load. Ecological, Industrial and Energy Security-2017: Collection of articles on the materials of the scientific and practical conference with international participation "Ecological, Industrial and Energy Security-2017" (September 11-15, 2017). Ed. Yu.A. Omelchuk, N.V. Lyamina, G.V. Kucherik. Sevastopol: SevSU, 1242-1245. (In Russian). Slivinsky, G.G., & Temreshev, I.I. (2018). Species diversity and abundance of insects in the territories of the south of Kazakhstan with various levels of contamination with heavy metals. Safety of Nature Management under Sustainable Development. Proceed. of the II International Scientific and Practical Conference, Irkutsk, November 19-21, 2018. FSBEI HE "ISU", Faculty of Geography, 233-238. (In Russian). Sobolev-Dokuchaev, I.I. (1993). The influence of the environmental conditions of the city of Moscow on the characteristics of ground beetles (Coleoptera, Carabidae). Biological Sciences. 2, 140-158. (In Russian). Sommaggio, D., & Burgio, G. (2014). The use of Syrphidae as functional bioindicator to compare vineyards with different managemants. Bulletin of Insectology. 67 (1), 147-156. Sushko, G.G. (2015). Insects - as indicators of the ecological state of bogs of the Belarusian Polesye. Proceedings of BSU. 10. 1, 359-367. (In Russian). Temreshev, I.I., Esenbekova, P.A., Kenzhegaliev, Y.M., Sagitov, A.O., Muhamadiev, N.S., & Homziak, J. (2017). Diurnal insect pollinators of legume forage crops in Southeastern Kazakhstan. International Journal of Entomology Research. 2; 2, 17-30. Temreshev, I.I., Esenbekova, P.A., Sagitov, A.O., Mukhamadiev, N.S., Sarsenbaeva, G.B., Ageenko, A.V., & Homziak, J. (2018). Evaluation of the effect of locally produced biological pesticide (AқKөbelek™) on biodiversity and abundance of beneficial insects in four forage crops in the Almaty region of Kazakhstan. International Journal of Environment, Agriculture and Biotechnology (IJEAB). 3, 1, Jan-Feb-2018, 72-91. http://dx.doi.org/10.22161/ijeab/3.1.10. Temreshev, I.I., Kazenas, V.L., Childebaev, M.K., Isenova, G.Zh., & Kozhabaeva, G.E. (2015). Preliminary list of indicator species of insects of South Kazakhstan. Almaty: Nur-Print, 165. (In Russian). Temreshev, I.I., Kazenas, V.L., Esenbekova, P.A., Isenova, G.Zh., & Kozhabaeva, G.E. (2016). Addition to the list of indicator species of insects of South Kazakhstan. Almaty: Nur-Print, 180. (In Russian). Wang, Y.P., Wu, H., & Xu, H.C. (2008). Biological and ecological bases of using insect as a bioindicator to asses forest health. YingYong Sheng Tai Xue Bao. 19 (7), 1626-1630. Zaitsev, G.N. (1974). Building scales for scoring. Biometric methods. M., 30-45. (In Russian).